People in Varteg in Torfaen fear they will be open to ridicule if proposals to use the Welsh language name 'Y Farteg' are adopted. Many road signs in Wales show place names in both Welsh and English, and Torfaen council is consulting on which forms should be used on signs and maps. The Welsh Language Commissioner supports the use of Y Farteg. Torfaen councillor Giles Davies said: "You can just imagine people taking photos and putting them on Facebook." Mr Davies said there was strong opposition from villagers, who have collected a protest petition with 150 names so far. The commissioner has told Torfaen council that Y Farteg is the name backed by the standard reference work, A Gazetteer of Welsh Place Names, and its recommendation should not be changed "without good reason". For phonetic reasons the Welsh language 'f' is sometimes anglicised to the English 'v', something which has apparently happened to Varteg over many years. 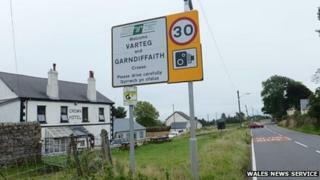 If Y Farteg was adopted it would not replace Varteg, and both names would be shown on local signs. But Mr Davies said: "Varteg is actually a Welsh name so we can't understand why people want to change it. "It would be leaving the residents of Varteg open to ridicule and it would also cost money to change. "When we first asked a couple of residents about it they were horrified. We went round and knocked doors and people were 100% against it." Fellow councillor Wayne Tomlinson said: "If they put that sign up it would just raise a laugh. I think there's nothing wrong with Varteg as it is and they should just drop it." Torfaen MP Paul Murphy has also voiced his opposition. He told the South Wales Argus: "I'm supportive of sensible steps to help the Welsh language, but this is not the way to achieve that - it will only fuel resentment." In a letter to the council, the language commissioner's office said it supported the recommendations of its predecessor body, the Welsh Language Board, that Y Farteg should be the standard form in both languages. It said its guidelines for standardising place names said if the difference between the Welsh and English forms was only one or two letters, then a single form was recommended with the preference given to the Welsh form. It also said Varteg should not be adopted as the single form of the name "as this is a corrupt and non-standard spelling of the original Welsh name". It also recommended the inclusion of the definite article "Y" (the equivalent of "The"). A Torfaen council spokesman said: 'This new consultation follows a three-week public consultation in January which considered 22 Welsh place names across Torfaen. "After discussion... the 'Farteg' was considered inappropriate and was not adopted at the time. "The Welsh Language Commissioner has proposed the alternative name 'Y Farteg' upon which the residents of the Varteg community will be able to express their views." The council will start its consultation on the name shortly and an event will be held in the community to gauge local views.